Transport Ministry has eased the norms to import foreign cars and bikes in India. However, these new easier norms come with some additional riders. Transport Ministry has removed stricter norms to import foreign cars and bikes in the Indian market. Now, easier norms have been put which will help the automotive industry in a positive way. Now, the foreign cars and bikes can be bought in India irrespective of their prices and capacity. The cars and bikes can be imported for personal use as well as automakers can import for equipment and emission testing. With this step, a lot of automakers might possibly think of bringing their global cars to the Indian markets. So what were the earlier norms? As per the earlier norms, the manufacturers are not allowed to import foreign cars and bikes if they do not meet the Indian standards. Neither it could come for testing, R&D purposes and nor for selling purposes. Now, automakers are allowed only homologation-free import of cars that are valued above 40,000$ or Rs 28.7 Lakhs. For two-wheelers, the manufacturers are only allowed to bring 2-wheelers with engine capacity above 800cc. So that means we can import any car and any bike! Yes, now you can import any bike or any car even if they are valued under Rs 28.7 Lakhs or if the imported two-wheeler is under 800cc. 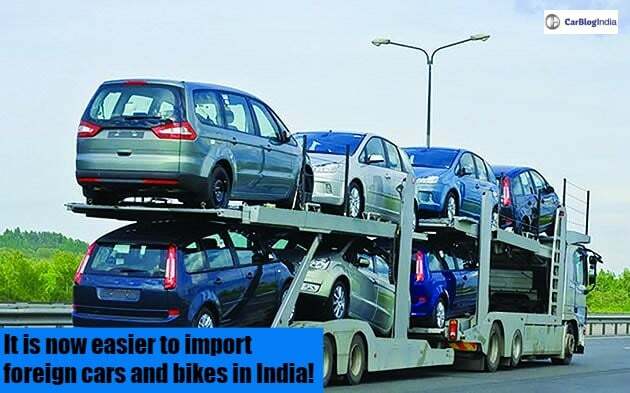 With this step, various automakers can start importing their cars and bikes for selling purposes in India. However, there are some riders too. Now, each automobile company can import only up to 2,500 units of a car or a two-wheeler in a year. These cars and 2-wheelers should comply with internationally accepted standards as well. Companies are also allowed to import up to 500 other vehicles such as buses, trucks and other commercial vehicles. Also, the imported vehicles need to have “right-hand steering control” to ply on the Indian roads. With this, there is scope for more cars in India. As per ET Auto, many automakers will now consider bringing such foreign vehicles that are important globally and will perform well in the Indian markets. Maruti Suzuki could consider bringing the Swift RS or the Jimny to Indian markets. Toyota, Nissan, Renault and more such brands could consider bringing their affordable sports cars to India. With this, there is a broader scope for the development of EV concept in India.